February 21, 1978 was a landmark day in Mexico City. A ditch digger struck something with his shovel. Scraping the dirt away, construction workers noticed it was an unusual sculpture. Work stopped at the corner of Guatemala and Argentina. Archaeologists were summoned. The carved stone disk had been uncovered that depicted the dismembered body of the moon goddess Coyolxauqhui, sister of Huitzilopochtli (sun god) and daughter of Coatlicue (the earth goddess). There was no mistake. 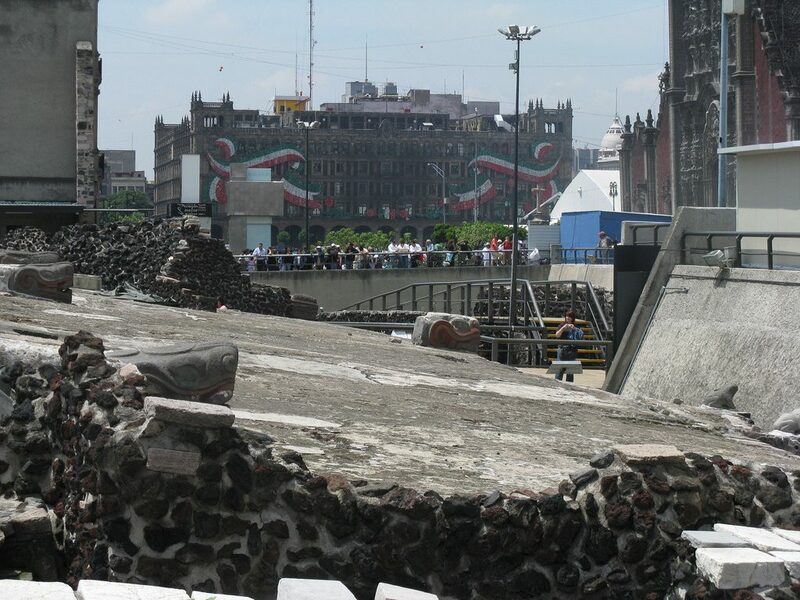 After nearly 500 years, Mexico was about to uncover the great Templo Mayor, the focal point of the Aztec Empire. In the first five years archaeologists recovered more than 6,000 pieces from the site — the best of which are now on display at the museum. The Templo Mayor is located at the site where the Aztecs received their prophetic vision — promised by their god Huitzilopochtli — of an eagle perched upon a nopal (prickly pear) cactus devouring a snake. Upon the site the Aztecs erected a pyramid with two temples, one to Huitzilopochtli and one to the agricultural rain god Tlaloc. Another legend suggests that the temple is constructed on top of two caves that are filled with a primordial water, home to Huehueteotl, the ancient god of fire and lord of time who occupied the center of the earth. In building their pyramid on this visionary site, the Aztecs honored sacred space. The Templo Mayor was the sacred mountain and sacrificial altar for the Aztecs. Diverse offerings were brought to this sacred place as a result of conquests and tributes. Many of the caches were water-related. The temple integrates symbols of water, earth, sun, and sky — natural elements honored by all Mesoamerican civilizations. The Aztecs constructed the temple to be not simply a fabricated structure, but an equal partner in the natural order of things. The temple was believed to provide the greatest source of all, the energy of creation. Because of its cultural and religious value, the temple was destroyed by Cortés after the Spanish defeated the Aztecs. At its height, the capital of the Aztec empire had a population of 250,000 — one of the largest cities of the world at the time. 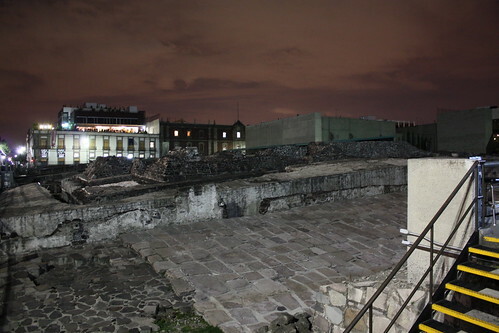 Location — The Templo Mayor is located in the heart of Mexico City.